Experience a theatrical and comical performance like no other, delivered by one skilful wizarding professor and an outrageously defiant and curious young apprentice at his helm. This magnificent duo will have your sides splitting (and fully repaired after the finale of course!) with their mischievous tomfoolery. Inspired by the enchanting world of Harry Potter, and the film productions which have graced Alnwick Castle, Potter Inspired Characters presents a wonderful blend of spellbinding sorcery, slapstick comedy and occasional mischief! So where better to enjoy this fun filled family entertainment than the location of Hogwarts School of Witchcraft and Wizardry itself? 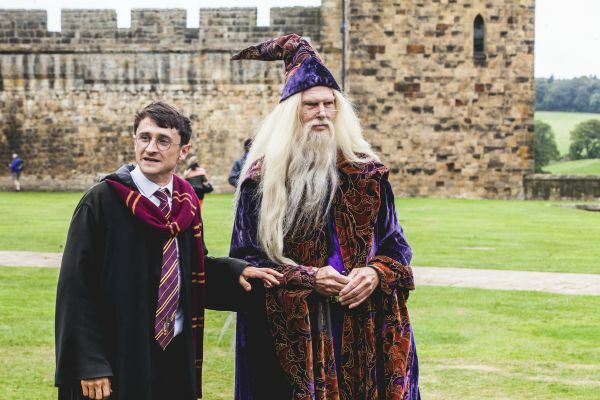 Costumed witches and wizards are especially welcomed to this brilliantly amusing spectacle which is free with admission to Alnwick Castle! For show timings and locations, please check the ‘What’s On’ board upon arrival to Alnwick Castle as these can vary throughout the season.